Jack McElroy was a follower-forward recruited by the Blues from Warracknabeal in north-western Victoria in 1935. Over the next five seasons, he alternated between VFL football at Carlton, and VFA football with Brunswick - winning respect at both clubs. McElroy arrived at Princes Park as a confident, ambitious 22 year-old, only to be brought down to earth by the realisation that if he wanted to play senior football, he would have to prove himself against Carlton’s strong line-up of followers. At the time, that group included club captain Charlie Davey, ‘Mocha’ Johnson and George Dougherty, as well as two other outstanding prospects in Rod McLean and Ted Pollock. It was a task that proved too much for Jack at first, and he spent his foundation year exclusively at Reserves level. In 1936, McElroy changed his mind, and was persuaded to join Brunswick. His wounded pride soon healed, and within 12 months he was regarded as one of the most influential followers in the competition – especially because he was also a capable forward who could take a big mark and kick straight. After his outstanding effort as Best on Ground in Brunswick’s excruciatingly close 2-point Grand Final loss to Prahran in 1937, Carlton decided that they had to get him back. A delegation was sent to Jack’s home, and before the following season began, he was settling in again at Princes Park. 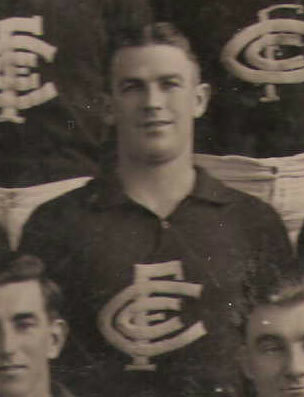 Allocated guernsey number 15, McElroy was selected for his first senior match for the Blues at home against Fitzroy in round four, 1938. Sharing the ruck duties with Carlton’s new captain-coach Brighton Diggins, Jack enjoyed a memorable debut, and kicked his first career goal as the Blues destroyed the Maroons by 51 points. Thereafter, McElroy played another nine games in succession. By mid-June, Carlton was two wins clear on top of the ladder and already certain finalists. But after a heavy defeat by Richmond at Punt Road in round 13, Jack was omitted from the side in favour of Ron Savage, and wasn’t able to force his way back in again before the finals. While the Blues went on to Premiership glory with a 15-point Grand Final defeat of Collingwood, McElroy played out another year with the Reserves. In 1939, as war in Europe loomed ever more likely, McElroy had to wait until round three for a senior recall, against North Melbourne at Princes Park. He was asked to play as a decoy full-forward for Ken Baxter that afternoon, and earned praise for his efforts. From then on, his seven matches for the year produced eight goals, but by July he was back in the twos. His last game in navy blue was a surprise defeat by St Kilda at the Junction Oval in round 10, and for the second year in a row, Jack ended the year kicking the dew off the grass each Saturday morning in the Reserves. Then, in September of that tumultuous year, World War II erupted when Germany invaded Poland, as Carlton finished off a hugely disappointing year by tumbling from premiers to fifth place on the ladder. In the circumstances, McElroy decided that his days at Princes Park were over, and made his way back to Brunswick. The Magpies finished fifth in 1940 and ’41, when McElroy was the club’s top goal-kicker with 55 majors. In 1942, Jack enlisted for military service and was allocated to the Provost Corps, or Military Police. He spent four years in uniform, before making it back home to Brunswick for one last season of football in 1946. In a tragic aside, Jack passed away on the 26th July, 1958 - aged just 45. 1937, May 21, Brunswick refused a clearance for Jack McElroy to cross to Carlton, despite Jack training with the Blues earlier in the season. Brunswick reasoned that if his wasn't good enough to be included on Carlton's list then, then he should be denied a tranfer, especially now that they (Brunswick) have reduced their playing list to 25. Carlton's renewed interest in him followed a couple of excellent performances for the V.F.A. Magpies. In 1939, Carlton were in Sydney to play N.S.W. on the Sydney Cricket Ground, July 29. J. McElroy: 26, 6ft. 0 3/4in. 13st. 2lb. A reliable follower and good forward. Contributors to this page: pblue , blueycarlton , PatsFitztrick , Bombasheldon , tmd1 , molsey , Jarusa , true_blue24 and admin . Page last modified on Tuesday 14 of August, 2012 21:30:05 AEST by pblue. 1987 GF - Blues belt out the theme song.